Peter does occasional shows "on the Road". He can demonstrate the technique, but because of the delicate nature of hand engraving he does no actual work on the road - one slip and a piece is ruined! From the first of June to the end of August he can be found most Saturday mornings at the Farm Market at the Plumsteadville Grange in Plumsteadville, PA. He was one of the first crafters to take part in the annual Fair of the Hilltown, PA, Historical Society and has become a fixture there. For many years he took part in the juried Folk Fest at the Mercer Museum in Doylestown, PA every Mother's Day weekend. That fair, however was discontinued and Byers Choice, a nationally recognized local company has decided to take that weekend for a new fair, and Pete has been asked to submit his work for consideration. One of Pete's first shows was a gun show that was sponsored by a neighbor and friend. 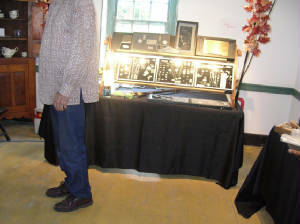 His display there is shown at left. 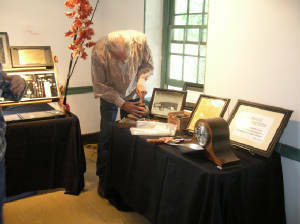 On the right is Pete at his display in the Hilltown Historical Society's Hartzell-Strassburger House - he is always in the front room of this wonderful old building. This summer Pete took a wonderful wooden chest that had belonged to his father, an archaeologist, and made it into a cart for his display. 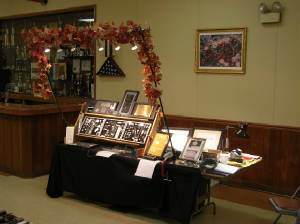 It is shown here at a jewelry show at a local senior center - in the photos above it is in "travel mode", just out of his trailer in the parking lot. Then he brought it inside and began to set it up. At the right it is shown in full display, lights and all - a truly eye-catching backround for his work.